Booking Mama: Review: Shirley J Mugging! I'm not quite sure that this review of Shirley J Mugging! 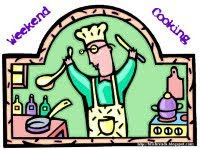 line should count as part of Weekend Cooking because the "recipe" is so very simple. However, I absolutely adore these products and couldn't wait to share them with you. Plus, you are "making" something which can be eaten, so I figured what the heck! When I arrived home from BEA, there was a pretty large box waiting for me. I knew it wasn't books and I wasn't really expecting anything, so I couldn't wait to open it and see what was inside. 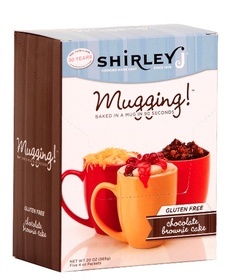 Much to my surprise, it was four big (and colorful) mugs along with some packages of Shirley J Mugging! mixes. Booking Daughter immediately started examining all of the boxes and wanted to test the products and give her opinion. Basically, all she had to do was dump the mix into the mug, add 5 tablespoons water, and mix. Naturally, she was fascinated that there were "options" to doctor the recipe, so she decided to add a quarter cup of mini chocolate chips. She just as easily could have prepared the Rocky Road version where you add chocolate chips, nuts, and mini marshmallows. Then she placed the mug in the microwave and had warm chocolate cake in less than two minutes. I know what you're probably thinking -- that this version of chocolate cake couldn't taste like real chocolate cake; however, you'd be dead wrong. Booking Daughter loved it! And I have to say, that I enjoyed it too. I thought the portion size was generous and the cake was very rich. In fact, she had a hard time finishing the entire serving. The next morning, Booking Daughter couldn't wait to make the No-Pan Pancakes. Once again, all she had to do was add water to the mix and stir, but she decided to add chocolate chips. Personally, I thought the recipes for banana pancakes and blueberry pancakes sounded even better, but what kid can resist chocolate? She loved the giant pancake in a mug and even admitted that she was surprised since the pancakes were whole-grain. As a mom, I loved the quickness of the preparation as well as the idea that she was getting a somewhat healthy breakfast. Now, if I could just get her to substitute fruit for the chocolate! Besides the chocolate cake and the pancake mixes, we also received a yellow cake mix that can be made into a cobbler, a corn bread mix, a walnut bread mix, a pumpkin spice bread mix, a quiche mix, and a gluten-free chocolate cake mix. Since I already knew that these products tasted good, I decided to test the gluten-free one. All I did was add water and some chocolate chips to the mix and nuke for a little over a minute. I didn't really have high expectations for a gluten-free product, but I ended up liking it quite a bit. I actually added a little whipped cream to the warm cake and ate almost the entire serving. Booking Daughter even tested it and she gave it a thumbs up too! There are so many great things about these Shirley J Mugging mixes, but one that sticks out to me is how perfect they are for gifts. You can order the mixes in a single 4 oz. pack ($3.00) or a package of five mixes ($12.95). You can also purchase the mixes as part of a gift set or bundle. How cute would a little mug with an assortment of mixes be for a teacher or a friend? Overall, I am extremely impressed with the Shirley J Mugging! line. Each mix is better than the next and I love the ease and quickness of preparation. It's been a huge hit in our house these past few days! Make sure you check out the entire Shirley J website. In addition to the Mugging! line, they have other delicious-sounding products. 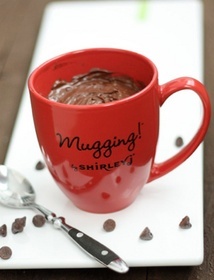 Thanks to Shirley J for providing us with the Mugging! samples. This would have been perfect for teacher gifts, but I'm too late for that. Maybe Christmas gifts. What an adorable idea! I love this idea! And I agree with Sandy, these would make perfect teacher gifts or hostess gifts. How wonderful that you were given a chance to test the product! These would be great for Vance - especially the pancakes for a quick breakfast! This sounds really yummy and fun - I would love to give this a try! Fun! Cool that they turn out so delicious, too. This is a fun idea and perfect for a teacher gift! I would love to heat this up at lunch time and have dessert ready for me! I agree with the others, what a perfect gift. And who would have thought of pancakes in a mug- very clever. I'd heard of baking things like this in mugs before, but it looks like Shirley J has really taken the idea and come up with a great gift product. What a cute idea. And they sound so yummy.